A personal journey from consumerism to minimalism. I thought I was doing well, and then I went into the garage to look for something. Oh look, it’s another box full of crap. Feeling ambitious in my quest to de-clutter, I grabbed a random box. It was on top of another box of course, but it wasn’t that big and I thought I could tackle it real quick before dinner. As I dug into the box I felt a sinking feeling in my gut. There were several framed pictures of my girls, three ice scrapers, four pens and 10 paper notebooks. 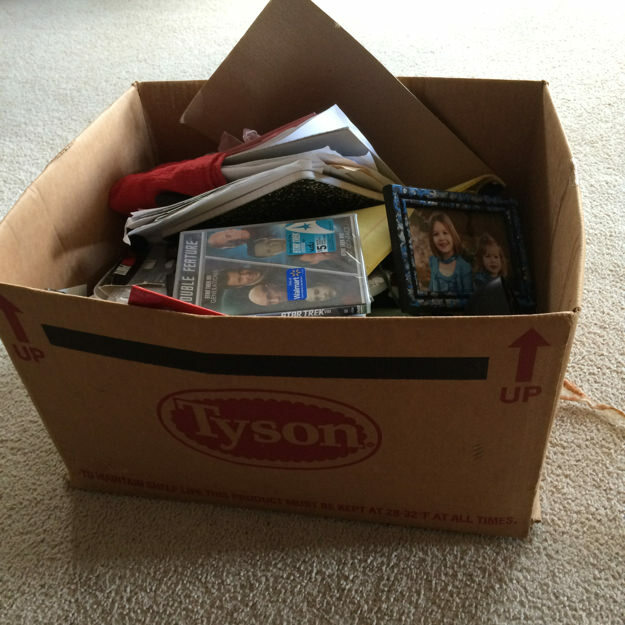 There was a little bit of easily discernable trash, but there were plenty of things that needed a decision made about their future right now since I had the box in front of me. Sorting through it all, I picked up a little momentum: The pictures of the girls will go on the entertainment center. The appliance manuals will go with the other ones I have stored in the basement. The DVD and some CDs can be taken to the store for some cash. The notebooks and some other items can be donated. I was feeling good, and then I hit the stack of papers. You know the bloodwork they make you get when you start a new job? The results from that test — from 2006 — it was in there. Some random document from the job before that was in there. A cover letter that had nothing more than the address of my former tax preparer was in there. And then, the one that stopped me cold: a pay stub from my dirty, grimy (but fun), blue collar, mid-college, summer of ’96 job was in there, too. 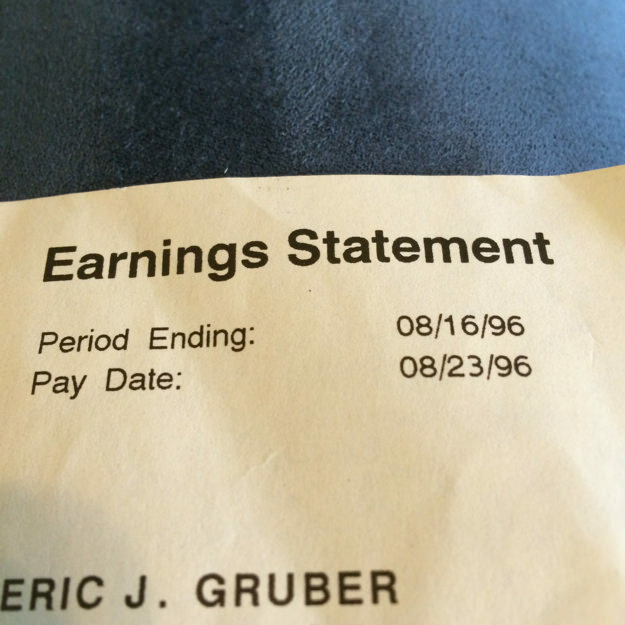 It’s a pay stub from a blue collar job I worked at almost 18 years ago. Seriously? One pay stub, and it almost sent me into a complete depression. Why? It had my parents’ home address on it. That means this one, worthless piece of paper that had my social security number on it and my hourly wage of $6 per hour had traveled with me through almost 18 years of moves. From Baxter Springs, KS, then to Carthage, MO, then to Joplin, MO, then to Lawrence, KS. While in Lawrence it went from my first apartment, then the Ohio Street house, then it went with me after I got married. After that, it went from our place on Cynthia, then to our place on Arizona, then to the Randall Road place, and finally to our current home. You have got to be kidding me. What have I done? Why did I keep this? How much more crap like this is there? I sulked a bit and walked around the room, then I regained my composure. I am firm in my resolve. The things that have no value to me have no place in my home. I redistributed the rest of the things to their appropriate waiting areas until I can take care of them this weekend, digitized some things I wanted to keep with my iPhone, then headed upstairs to the shredder and said goodbye to those papers for good. I couldn’t tell if I was actually making progress, or if it was just a pyrrhic victory. I really have no idea how many more papers and knick-knacks that have no value to me are in the house, and especially in the garage. I just know the amount is large. And therein lies the potential danger of home organization. When the items are in a box, you can put a lid on it and store it, move it, stack it, and take it with you everywhere, forever. But it’s easy to avoid all the things inside the box until you choose to do so. It has never been more clear to me than it is now: I have a lot of work to do and it’s way, way, way overdue. This entry was posted in Thoughts on May 30, 2014 by ericjgruber. In turn, Amy told her that her job as a parent is to take care of her, discipline her, and to love her. “Do you feel loved?,” Amy asked. “Yes,” was Ember’s reply. “Then I’m doing my job,” Amy said. We don’t see our role as parents as the purveyors of happiness. Sure, we want our children to have happy lives, be healthy, seek out good relationships, and have an good overall sense of well-being. But it is not our responsibility to make our children happy. It is our duty to teach our children how to be happy. My minimalism journey is, in part, because I want to be an example to my children so they might not end up with the same stuff disorder as their parents. It is my goal to teach my children that you can be happy without having an excess of things. This will be a tough sell, of course. Our society does a fantastic job of encouraging desire for the next new thing. How many times have you purchased something and it made you feel really great? You get high from the shopping experience, take your stuff home, and revel in your purchase. New pair of shoes? Fantastic! New phone? Shiny! New car? Love that new car smell! The truth is, that feeling does not last. In turn, we consume more and more in our endless pursuit to feel good. Eventually, we end up with a house full of stuff and still left feeling unfulfilled. Sadly, it doesn’t stop with tangible items. Should we be teaching our children that a boatload of activities and a house full of things is the path to happiness? Or, should we instead teach that there are some things they can do and some things they can have that will add value to their life without bringing on stress from excess? We pick one or two activities to sign the kids up per year, and that’s it. We find this manageable and sustainable. As for the toys and the knick-knacks and the endless stream of artwork my kids create that they can’t let go of … we’re working on it. This entry was posted in Thoughts on May 28, 2014 by ericjgruber. The top of our refrigerator has become our version of my parents’ roll-top desk. For us, it is the place where “I’ll deal with it later” things like junk mail, odds and ends, and other assorted crap end up. I was cleaning out our makeshift junk repository when I saw this heart-shaped box. 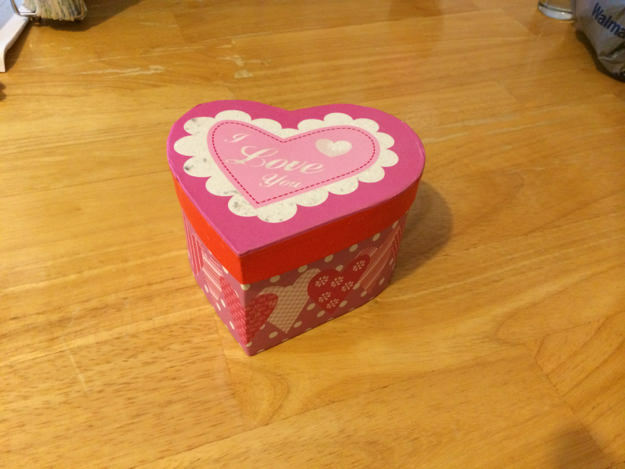 This heart-shaped box contained a Valentine’s Day gift for the wife. I thought, “Oh yeah, I remember that. 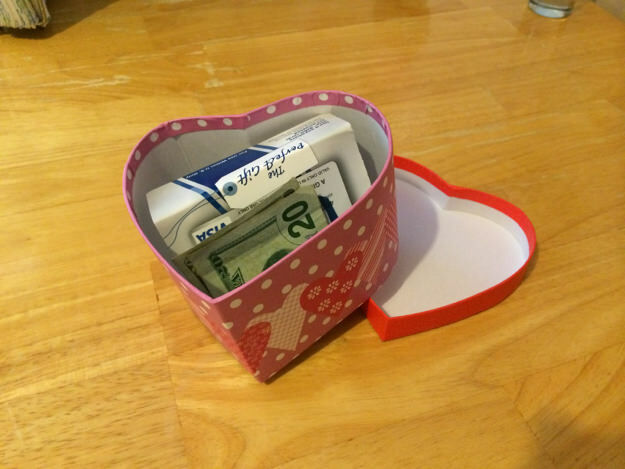 I went to the $1 store and picked up some cheap stuff to use for Valentine’s Day.” We must have forgotten to do something with it, but since it was on top of the refrigerator, that wasn’t a big surprise. I was about to throw it away, but my wife, Amy, decided to look inside real quick. It’s a good thing she did. Turns out, the box has $20 cash and and $25 gift card in it. Glad we didn’t throw that away! Inside the box was a $20 bill and a $25 Visa gift card. Have a system in place to handle your gift giving and receiving event. My aunt once threw away a $50 bill by accident one year. After the family unsuccessfully dug through the trash, it was decided it likely got burned up when my grandfather took the trash out earlier that day (country living means you burn your trash). Even though it was “just a dollar,” I spent money on packaging for a gift that has been forgotten for months. I donated the box to Goodwill. What was the point of that again? Some types of gifts might not be the best choice for the person, or, at the time. I’m sure my wife likes to get gifts, but let’s face it: it clearly didn’t appear to add value to her at that time, otherwise she might have been more aware of her gift’s disappearance (she claims that’s not the case, but I’m skeptical). Perhaps I need to learn more about my wife to see what kind of gift would be a better choice. The main point is: purge with care. Take a moment and review what you’re throwing out, because you might be throwing out more than just stuff. This entry was posted in Recycled, Thoughts on May 27, 2014 by ericjgruber. 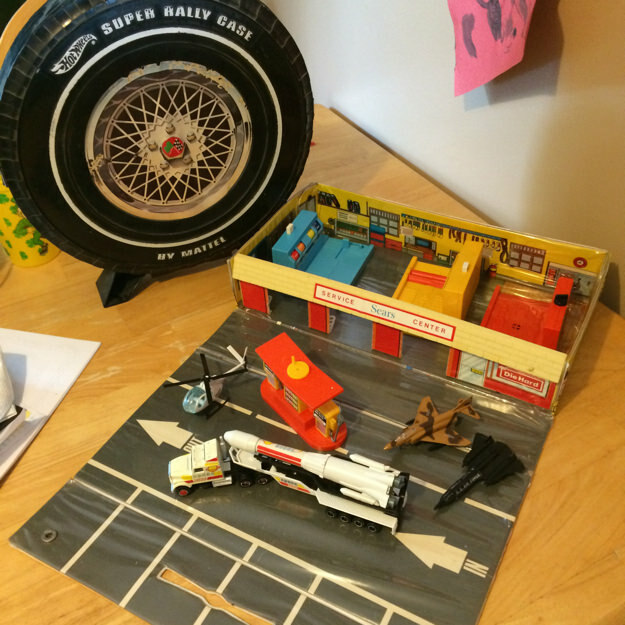 Hot Wheels car carrier and portable playset. One of my favorite pastimes as a kid was playing with Hot Wheels™, Matchbox™ and other types of small cars. That tire case above is full of cars, trucks, tanks, planes and helicopters that was well loved, a lot of times in the bathtub. I would often grab that case and the Sears Service Center case pictured and play in the family room of my parents’ home. We had red, shag carpet for a long time in that room, so playing with the cars on the floor caused me to pretend that I was driving through the jungle or high grass. If you can tell from the picture, I had a few airplanes as well. I guess I was a child of the Cold War, but only the last remnants of it. It’s not like I had to do “Duck and Cover” drills in school or anything. But we had Rambo, G.I. Joe, Rocky IV, Reagan and Gorbachev – we knew the Russians were our enemy. I flew those planes all over the house. My imagination and those metal vehicles took me places. These items have been sitting in my closet for the last year. My parents hadn’t thrown them out so when I discovered them at their house, I brought them to mine where they’ve stayed ever since. And now they’re gone, donated to Goodwill. The one thing that caught me off guard about my old, tired cars and sets was the reaction of my oldest daughter. She took them off to her room to play with them for awhile until it was time for them to go. The cars no longer provided value to me, but she’s definitely interested. So I promised her we would get her a new set eventually. What she doesn’t know is that my eventually comes with a catch: we have to get the room she shares with her sister under control first. We’ll get there. Baby steps. But first, the parents need to lead the way. Then we can go find some cars that add value to her childhood. This entry was posted in Recycled on May 26, 2014 by ericjgruber. My journey toward minimalism began with a tornado. On Sunday, May 22, 2011, an EF5 tornado ripped through Joplin, Mo., destroying the homes of a few of my friends and changing their lives forever. I grew up near Joplin in nearby Baxter Springs, Kansas, which was also hit by a smaller EF2 tornado on Monday, April 28, 2014. Not long after the the Joplin tornado, my wife and I went there to help in the cleanup. We helped people as they rummaged through the debris for what they could salvage from their former livelihood. During that experience, I found something really striking about the people whose homes we helped clean: they didn’t care about most of their possessions. Instead, we ended up being on a mission to find that one family keepsake they wanted to salvage, or that couple of personal items that they hoped we could find in the wreckage. After the cleanup, after I had time to think about all I had seen, it made me wonder: why do we keep so many things that we don’t think are exceptionally important? Not long after that I stumbled across The Minimalists, a team of two friends who were enriching the world through their blog about a life of more substance and less things. I was intrigued, but not so much that I changed my life overnight. But it got me to think, and that’s always a good important first step. Now we fast-forward to 2014. I look at my two children and their room, and I think I’m a guest on the TV show Hoarders. I realize how much children absorb from their parents. My life is no different. I have things in my home that I keep for nothing more than sentimental value but very little utility. I’ve coined my illness sentimental attachment disorder, because every time I go to throw things away, I’m paralyzed. Maybe I should keep this because of the memories I have from it. What if I need this later? Shouldn’t I have a backup of this thing just in case? I would hate to just give it away or sell it, because I paid more for it and I’d lose money. The excuses are endless for why we hold onto things. And then, a sea change. The Minimalists came to Kansas City on April 24, 2014 for a tour of their latest book, Everything That Remains. Hearing them speak gave me a renewed sense of urgency. I need less things. I need more things of value. The most meaningful tactic they taught me was one sentence. That is to say, whenever you start to purchase something, or whenever you are trying to decide to keep something, ask yourself this question: Will this thing add value to my life? They also offered a challenge; a 21-day one, in fact. Their 21-day challenge is where you get rid of one thing on day one, two things on day two, and so on, for 21 days. I started it in May of 2014 but didn’t finish for two reasons. First off, life got in the way and it became quite a chore to keep up consistently (I made it to day 12). But second, I found my sentimental attachment disorder getting in the way of getting rid of some items that I knew had to go. This is where The Chaff comes in. I will continue my journey to minimalism through here and I hope you find some inspiration. Along the way, I will tell the story of the items I’m letting go for my own closure. In turn, I hope you find the strength to do the same if that’s your calling. I have found this to be true, and frankly, I’m tired of it. I refuse to be a slave to my possessions and instead choose to pursue a more meaningful, rich and full life of experiences, relationships, and personal freedom. Thank you for reading my story. Feel free to come along on my journey. This entry was posted in Thoughts on May 26, 2014 by ericjgruber.